Tingling of lips, laryngeal oedema, generalised angioedema, generalised urticaria, bronchospasm, abdominal pain (Noyes et al. 1979 ). Diffuse pruritus, urticaria, angioedema, nausea and vomiting, chest tighness and wheezing followed by vascolar collapse and loss of consiousness in one patient and diffuse pruritus, urticaria and facial angioedema in another (Halsey et al. 1986 ). Anaphylaxis beginning with abdominal pain, followed by pharyngeal pruritis and facial oedema with nasal congestion and finally generalised urticaria and impaired respiration (Kanny et al. 1994 ). Symptoms ranging from itching of the mouth, ears and eyes, cough dyspnea, generalised urticaria, angioedema (Axelsson et al. 1994 ). Anaphylaxis with laryngeal oedema, dyspnea, vomiting, generalised urticaria and hypotension (Iwaya et al. 1994 ). Oral pruritus (8/12), anaphylaxis (4/12), angioedema of lips/mouth (4/12), gastrointestinal symptoms (3/12), urticaria (2/12), and rhinoconjunctivitis 1/12 patients (Garcia-Ortiz et al. 1996 ). Vomiting and hypotension; urticaria and angioedema; itchy mouth; anaphylaxis; angioedema and fever in 5 patients (Kelly et al. 2000) . Asero et al. (2002)  used seeds from the roll to which the patient had reacted. Histamine was used as positive control in all studies. The definition of a positive response was >3 mm or >5 mm diameter wheals. Number of Patients:3 patients (Noyes et al. 1979) . Stricker et al. (1986)  tested 102 patients who had suffered idiopathic anaphylaxis (such as reactions to an unknown allergen) with a battery of 79 skin tests. 1 patient (Kanny et al. 1994) . 3/4 patients were tested (Axelsson et al. 1994) . 1 patient (Iwaya et al. 1994) . 1 patient (Asero et al. 2002) . Three patients who had reacted to sunflower were strongly positive (Noyes et al, 1979 ). Stricker et al. (1986)  found 3 patients were SPT positive to sunflower seed and this was clinically relevant in one case. Three patients were positive to sunflower seed (a fourth was not tested) (Axelsson et al. 1994 ). A wheal of 7x18mm on SPT to sunflower seed (Iwaya et al. 1994 ). Positive SPT in 5 patients Kelly et al. (2000) . A wheal of 10 mm diameter on SPT with roast sunflower seeds (Asero et al. 2003 ). Food/Type of allergen:Salted roasted and unsalted raw seeds were ground and extracted in 0.01M phosphate buffered saline or water respectively overnight with shaking at room temperature. Extracts were centrifuged (3180 g for 30 minutes at 4 degrees) and stored at -20 degrees (Kelly et al. 2000) . 3 patients (Noyes et al. 1979) . Noyes et al. (1979)  found IgE to sunflower extract in two patients by RAST. Iwaya et al. 1994  found IgE to sunflower by RAST and immunoblotting gave a mass of 13.5 kDa. Kelly et al. (2000)  found positive RAST scores in three patients with sunflower seed positive skin prick tests. Immunoblotting separation:Kelly et al. (2000)  used 10-20% gradient precast gels (Novex, San Diego, CA, USA) for SDS separation. Kelly et al. (2000)  also used 12.5% preparative SDS-PAGE and pH 3-10 isoelectric focusing. The gel was incubated in equilibrating buffer (25 mM Tris-HCl, 192 mM glycine containing 20% MeOH) for 15 min, and then proteins were transferred to a PVDF membrane with a semidry blotter. The membrane was then blocked with 1% (w/v) casein in PBS, 0.025% (v/v) Tween 20. The membrane was cut into strips before incubation with sera (1:10 diluted in casein blocking solution) overnight at 4°C. The strips were then washed four times with PBS solution containing 0.025% (v/v) Tween 20. Membranes were then incubated with goat antihuman IgE horseradish peroxidase conjugate for 4 h at 4°C. The membranes were washed again four times as before, and chemiluminescent reagents (Amersham, Arlington, Heights, IL, USA) added to reveal binding (Kelly et al. 2000)  and . Iwaya et al. 1994  found IgE binding to a 13.5 kDa allergen. Kelly et al. (2000)  found that sera bound 2 to 7 distinct proteins of 10.5, 13.5, 15.9, 16.7, 17.2, 22.7, 33.2, 43.6, and 48.9 kDa. Two out of three sera recognized two proteins between 16 and 17 kDa. Kelly et al. (2000)  identified the purified 2S albumin as the major IgE binding protein in the sera from these patients. The sera recognised allergens after IEF with pIs of 5.91 (mature) and 5.35 (consistent with the 16 kDa precursor). Asero et al. 2002  found IgE binding to three proteins with masses near the 14 kDa standard and to one between the 43 and 67 kDa standards. Food used and oral provocation vehicle:Kanny et al. (1994)  used sunflower oil and sunflower seeds. Bernstein et al. (1982)  used sunflower seeds in capsules. Blind:Bernstein et al. (1982)  was double blind for one patient and open for the second. Kanny et al. (1994) was open. Dose response:Kanny et al. (1994)  report a response to 5ml of sunflower oil. Bernstein et al. (1982)  reported a response to 14.6 g of sunflower seeds in both patients. Symptoms:Bernstein et al (1982)  report urticaria and shortness of breath in two positive challenges with sunflower. Kanny et al. (1994)  report abdominal pain 2.25 hours after challenge with oil; cough, impaired respiration, facial angioedema after a further 8 hours. Patient experienced rhinitis 24 hours after challenge with 2g of sunflower proteins from seeds. Sensitisation to mugwort pollen has been reported to lead on to food allergy to sunflower seeds (Wen and Ye 2002 ; Garcia Ortiz et al. 1996 ). Asero et al. (2002)  reported a case of IgE cross-reactivity between sunflower and mustard seeds. Pre-absorption of serum with mustard extract inhibited all binding to sunflower in the 13-15 kDa region but not the 43-67 kDa region. Axelsson et al 1994  suggest that the route of sensitization was probably by inhalation of airborne sunflower seed allergens as all four patients had kept cage birds fed on sunflower seeds. They tested atopic patients who had kept birds and found 79% sensitised as judged by SPT and 21% by RAST. Asero et al. (2002)  also reported that their patient kept cage birds fed on sunflower seeds. Sunflower oil was reported to cause allergy by Kanny et al. (1994)  but Halsey et al. (1986)  reported that their 2 patients could tolerate sunflower oil. Zitouni et al. (2000)  show that a 67 kDa allergenic protein is present even in refined oil but the lower molecular mass allergens are removed. It is likely that as reported for peanut oils, the extent of refinement will affect the allergenic reactivity (Crevel et al. 2000 ). Allergy to sunflower pollen has been reported. This may cause food allergy in honey (Bauer et al. 1996 ) due to residues of pollen grains. 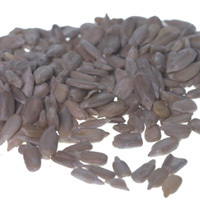 It is less likely to lead to reaction to sunflower seeds since the protein compositions are different. Besler M, Hefle SL, Jenson-Jarolim E.
2S methionine-rich protein (SSA) from sunflower seed is an IgE-binding protein. [A report of 50 patients with artemisia pollenosis and plant food allergy] Chinese. Identification of sunflower seed IgE-binding proteins. [A case of anaphylaxis caused by sunflower seed]. Article in Japanese. Kanny G, Fremont S, Nicolas JP, Moneret-Vautrin DA. Food allergy to sunflower oil in a patient sensitized to mugwort pollen. Zitouni N, Errahali Y, Metche M, Kanny G, Moneret-Vautrin DA, Nicolas JP, Fremont S.
Influence of refining steps on trace allergenic protein content in sunflower oil. Bernstein M, Day JH, Welsh A.
Double-blind food challenge in the diagnosis of food sensitivity in the adult. Protein Family:2S seed storage family, PFAM PF00234; tryp_alpha_amyl; 1. Process, chemical, enzymatic:Murtagh et al. (2003)  showed that recombinant SFA8 is resistant to pepsin digestion. Kortt & Caldwell (1990)  purified 2S methionine-rich albumins from the seeds and the sequence was reported by Kortt et al. (1991) . Kelly et al. 2000 ) used this method and Pandya et al. 2000  and Burnett et al. (2002)  modified it as shown below. Burnett et al. (2002)  ground dehusked seeds from the variety Alphasol in a blender and defatted twice with petroleum ether (60-80°C) at 4°C using a 20:1 solvent/meal ratio. The defatted meal was extracted for 2 hours at room temperature with 10 volumes of 20 mM Tris/HCl containing 0.5 M NaCl and 1 mM phenylmethylsulfinyl fluoride at pH 7.8. The slurry was centrifuged at 13500 X g at 2°C for 30 minutes. The supernatant was cooled to 0°C and cold methanol added to 60% (v/v) to precipitate globulins. This was centrifuged at 13500 X g at 2°C for 30 minutes. The albumins were precipitated by the addition of 3 volumes of acetone and after standing for 16 hours at -20°C, the precipitate was colled by centrifuging at 13500 X g at 2°C for 30 minutes. The precipitate was extensively dialysed against water at 4°C for 48 hours using a membrane with an Mr cutoff of 3,500 (Spectra/Por 3, Pierce and Warriner). The precipitate was removed by centrifuging at 13500 X g at 2°C for 30 minutes and the supernatant was lyophilised. The albumins SFA-7, SFA-8 and the nsLTP were separated using a Vydac 218TP1010 (250 x 10 mm) column using a 10-50 % (v/v) acetonitrile gradient made with 0.07% (v/v) trifluoracetic acid in water and 0.05% (v/v) trifluoracetic in acetonitrile. Proteins were identified by SDS-PAGE. Alcocer et al. (2002)  expressed the sunflower albumin SFA8 in Pichia pastoris and purified it by FPLC using a heparin-sepharose column. It had the expected mass (with two extra amino acids) and CD spectra. Amino acid and cDNA sequences of a methionine-rich 2S protein from sunflower seed (Helianthus annuus L). Pantoja-Uceda D, Shewry PR, Bruix M, Tatham AS, Santoro J, Rico M.
Solution structure of a methionine-rich 2S albumin from sunflower seeds: relationship to its allergenic and emulsifying properties. Burnett G. R., Rigby N. M., Mills E. N. C., Belton P. S., Fido R. J., Tatham A. S. & Shewry P. R.
Pandya MJ, Sessions RB, Williams PB, Dempsey CE, Tatham AS, Shewry PR, Clarke AR. Structural characterization of a methionine-rich, emulsifying protein from sunflower seed. Kortt AA & Caldwell JB. Low molecular weight albumins from sunflower seed: identification of a methionine-rich albumin.